The Great Venice Toy Drive + Snow at Oakwood Park! - Yo! Venice! 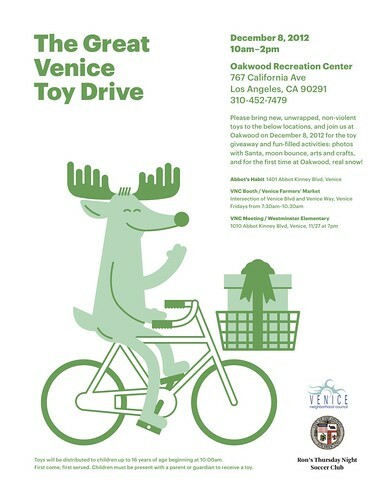 Home Abbot Kinney Blvd The Great Venice Toy Drive + Snow at Oakwood Park! The Great Venice Toy Drive + Snow at Oakwood Park! I know it is the beginning of November, but I am putting this up now so that while you are holiday shopping you can grab a gift for those in our community that are in need! Once you have the gift(s), drop them off at the locations listed below! On December 8th from 10am-2pm the gifts will be given away at Oakwood Park, with fun-filled activities including photos with Santa, moon bounce, arts and crafts, and for the first time at Oakwood, real snow! The Great Venice Toy Drive!